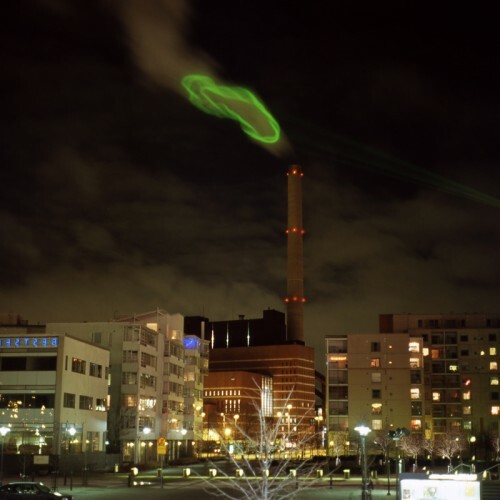 French artists Helen Evans and Heiki Hansen (AKA HeHe) used a high power laser to draw attention to the coal burning power plant in Helsinki. The clouds of smoke were illuminated every night for a week. Really really cool idea to protest pollution. Non-violent, totally legal way to show everyone how much smoke spews out every night. Did the lasers move as the smoke did in the wind? If so, that’d be so awesome! If not it takes a bit away. Excellent work either way. There is a video of it in motion below. It’s a million times cooler; the projection was a circle I think, so it basically outlines the smoke as it billows out! So what power sources do Evan and Hansen promote? I find it a pit humorous that they were using a product of pollution, powered by a product of pollution to protest that pollution. I get the feeling these ‘artists’ did not think this through very well. This is very interesting, and thanks for posting in Charlie! 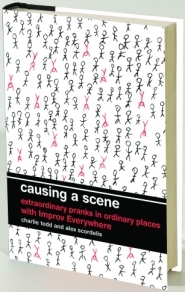 I wish that it was done as a prank, and not as a misguided piece of ‘art’ or protest, though. Yes what are the alternative reliable power sources? Are you willing to pay 5-10 times as much for “green” electricity? The whole paying 5-10 times as much depends where you live. This is a good way to inform the “average joe” of pollution. You are aware of all the thermal pollution, and damage to waterways, wetlands, and natural habitats hydro dams create? What about all the vibrations and noise that disrupts large tracts of habitats? My point is that while still marginally better, there are no great solutions to the problem — and simply crying about the pollution of one does nothing to solve the problems. Oh, but it does raise awareness, which in turn can often encourage the developement of technologies that could help? You need to make people aware of problems before you can expect anyone to do anything about them. This was an awesome idea.!! BS, He is boucing a laser off of steam. condenses, resulting in a white cloud. The same cloud comes from a cooling tower. Google “power plant pollution” and go to images. All the images I saw were steam. Some used filters, but they were steam. Coal emissions are black. CO2 you can’t see. I welcome comment, just trying to pass on info.